Hey there friends - welcome to Thinking Out Loud Thursday. Each week I share something I'm doing a little thinking about and hope, if you're a blogger, you'll link up below and share what's on your mind today. Spring happened on the calendar a few weeks ago, but here in St. Louis the thermometer is just now catching up. We had several evening since the spring began on March 20 that it got down right cold at night. Well, the temperature are starting to warm up and the trees are starting to show signs of new life. The days are slowly getting longer and I can feel myself coming out of hibernation. All this calls for setting some spring goals! Now, I'm using the term "garden" pretty loosely. We have a little postage stamp size plot of land we plant a few tomato plants in each year and several herbs. Regardless of the size, it just makes me feel good to be growing something in the back yard. Eric and I have talked about going to Ireland this year. We just need to pull the plug and make it happen. We've never been there before. Have you? Would love to hear some recommendations! Guys - this will be no small fete. The very few people who I have allowed to see my craft room can attest to the messiness of the situation. I have literally layers of projects in there and honestly, it's overwhelming to me to step inside this room. But I'm going to tackle the chaos before the clock strikes midnight on the last day of spring! Seriously, if I don't have it cleaned up by then I'm going to put everything in trash bags, throw them away and just start over. I want that room to be what it once was - a place I could let out my creativeness. Wish me luck. You might remember when I blogged about our 2019 goals (HERE), one of the items was to find a new church. We have been going to a new church since the first of the year and really enjoy it. the thing is, we really haven't met any new people. My next step is to try to find a small group within the church for us to join. Spring seems like a good time to make that happen. I have no idea what happened to our yard, but last fall weeds completely took it over. We (Eric) put down weed killer and we were left with so many bare spots! Basically, our yard looks like crap right now. We (again Eric) has been slowly getting seed down and trying to fill in the bare spots, but it's going to take a lot more work. I'm actually going to try to help him and together hopefully we'll have a lush yard by the time summer gets here. I bought this gorgeous full length mirror in hopes of being able to do a few fashion posts. Have I done it? No! So I'm adding this to my goals in hopes that will be the nudge I need to make it happen. I love seeing others fashion finds and want to start showing you some of my best finds. Stay tuned! So there you have it - my 2019 Spring Goals. 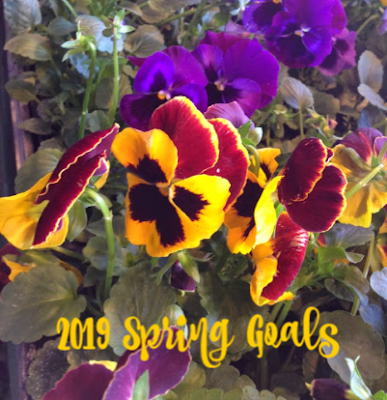 What are some things that you're hoping to get accomplished this spring? Now it's your turn. What are you thinking out loud about today? Link up and share! Hope you guys have luck finding a small group in your church! I think that is definitely a helpful way to feel more connected and meet people - I started going to a class shortly after I found my church and it's been a great experience ever since! Thanks for hosting and I hope that you have a wonderful Thursday. We are coming to St. Louis this summer! At some point. We are doing St. Louis and Branson so I can cross Missouri off my cute map and say I've been there. If you have suggestions on what to do with kids (age 13, 11, 4, and 3) let me know! Yay that you're coming to St. Louis! There are tons of great things to do in the city with kids. I would highly suggest checking out the St. Louis Zoo, Science Center, Magic House and City Museum. Hey Penny...I didn't realize you are in St. Louis. We are going to be out there next week for a Walking Cradles Shoe Stravaganza. If you have time, I'd love to meet up or maybe you can come to the event. Email me at jodie@jtouchofstyle.com if you're interested. Thank you, Penny, for your invite to join the Thinking Out Loud Thursday link up. I've been to Ireland (Dublin, Cork, and Killarney) and love the country. Killarney area is beautiful. Have a wonderful Thursday! Those are some good goals friend! Our grass needs some help too, I"m thinking more water? Hmm...??? Thanks for the link up! Ooh I can't wait to see your fashion posts! I wish I had a full length mirror. My parents do, so I use theirs in the mornings when I drop off my son to do my Instagram posts but I'd love to be able to do it at home! Not sure what happened to my comment!! I am knee-deep in cleaning my craft space, too. But have the hard part done. The organizing. Now to use the stuff I have all organized!! Want to wash the curtains, blinds and clean the carpet. Maybe tomorrow. I want to open up My Fashion Haus and do some posts so let's link up together!! Shoot me an email and maybe we can do something on a theme or just post on the same day?? Our grass is looking good but our pool is staying filthy with the March, now April winds. I want to swim not brush the sides!! We definitely need to work on our law; we did a huge overhaul of it last summer (into fall) and it poured like crazy so large sections of the hill washed away and we have little rivers of dirt missing. I'd also like to plant a few container gardens.. maybe some zucchini, tomatoes, and basil. Thanks for your email, I've done my Thursday thoughts (although it is Friday over here now!) looking forward to seeing what everyone else is thinking about today! Sounds like you have a busy Spring! So exciting to finally be planning your trip to Ireland. I've never been, but would love to go someday. I can't wait to see your fashion posts too!